nextAuth can easily be integrated with major online platforms. 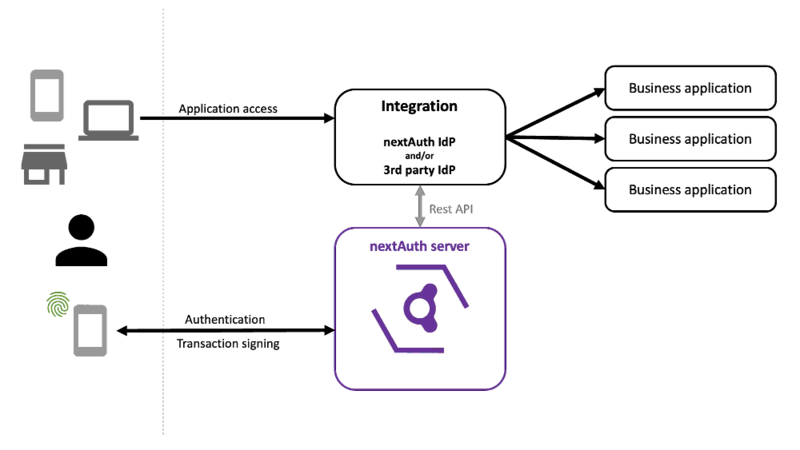 The nextAuth authentication server acts as the endpoint for authentication by the nextAuth mobile library. It handles all server-side credential management, creation of new device accounts and session management (including push messages). The authentication server offers a privileged REST API for integration with business application back-ends. It can also be integrated through SAML, OAuth2 and OIDC by using the nextAuth IdP. Management of user attributes and identity verification is performed through separate modules and applications. Contact us for questions on integrating a specific application.